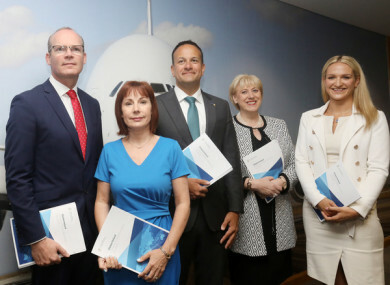 Pictured (l to r): Tánaiste Simon Coveney, Minister for Culture, Heritage & the Gaeltacht Josepha Madigan, Taoiseach Leo Varadkar, Minister for Business, Enterprise & Innovation Heather Humphreys, and Minister of State for European Affairs Helen McEntee, as they launched the plan today. THE GOVERNMENT HAS announced a series of new embassies, cultural programmes and other measures aimed at significantly increasing Ireland’s international outlook and impact over the next seven years. The measures are outlined in the new plan – Global Ireland – Ireland’s Global Footprint to 2025 – which was launched by the government this morning. An Taoiseach Leo Varadkar was joined by Tánaiste Simon Coveney as well as a number of government ministers in announcing the plan. Speaking at the launch today, Varadkar said that the purpose of the plan was to double Ireland’s global footprint in the coming years. Varadkar said that there was “an urgency to this, and the reasons are self-evident”. He said technological advancements and geopolitical shifts were driving change across the world, and trade was experiencing a moment of turbulence, while closer to home the UK was planning to leave the EU. “The challenges we face demand comprehensive multilateral responses,” the Taoiseach said. It is the only way to make a significant difference on issues such as climate change, security, taxation in the new digital world and migration. As part of the announcement today, Tánaiste and Foreign Affairs Minister Simon Coveney said seven new diplomatic Missions will be opening in countries across the globe. These include three new embassies – in Kiev in Ukraine, Rabat in Morocco and Manila in the Philippines. As well as these, Coveney announced the opening of consulates in Cardiff in Wales, Frankfurt in Germany and a Consulate General in Wales. These follow on from the announcement of the opening of six new offices – embassies in Chile, Colombia, Jordan and New Zealand, and Consulates General in Vancouver and Mumbai last autumn. “These increased resources abroad will help Ireland play our full role in addressing global challenges, while also meeting our moral obligations as global citizens,” said Coveney. The government also said it was reaffirming its commitment that it would provide 0.7% of the country’s gross national income (GNI) to development assistance by 2030. In doing this, it will publish a White Paper on International Development which will outline plans and proposals for Ireland to increase its presence and impact in countries where it is targeting its overseas development assistance. Ireland will also launch its bid in July to join the UN Security Council for the years 2021-2022. “If successful, this will place Ireland at the heart of UN decision-making on matters of vital importance, including international peace, security and development,” plan states. Other measures of the plan include increasing awareness internationally of Ireland’s culture and heritage and enhancing the country’s “digital footprint”. Email “'There is an urgency to this': The government wants to double Ireland's 'global footprint' by 2025”. Feedback on “'There is an urgency to this': The government wants to double Ireland's 'global footprint' by 2025”.